Like Chinese cuisine and Chinese culture, this film is a study in contrasts. It explores the evolution of Chinese cuisine from basic peasant fare to highly refined and lavish imperial cooking. It is the first film in the classic four-part series, “A Taste of China,” which remains perhaps the best introduction for Westerners to traditional Chinese culture. The film opens at the Shandong State Guest House in north China, where it captures the behind-the-scenes drama as two of China’s Master Class Chefs prepare an astonishing 28-course banquet. Featured are such elaborate delicacies as orange jelly in the form of a goldfish and a “peacock” centerpiece whose body is carved from a large turnip and whose plume is of sliced egg white, smoked fish, slivered cucumbers, and ripe cherries. A highlight is the making (or “pulling”) of “dragon whiskers” noodles completely by hand. 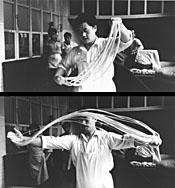 Beginning with a single lump of dough, the noodle maker rhythmically swings and pulls and stretches and doubles it until more than a thousand even strands are produced — in less than a minute. The film then visits Confucius’s birthplace in nearby Qufu to study the robust peasant fare — whose staples are wheat, millet, and corn — that nourished the sage and formed the basis of all northern Chinese cuisine. An unusual attraction is a look inside a shop in which women make the special five-foot-long He-Le, or “longevity” noodles, for festive occasions. Afterward, the film tours an exotic spice market and cooking academy for new chefs in Sichuan Province, and concludes by joining a group of artists and writers at a Chrysanthemum banquet in celebration of autumn.